Salati, S., Doudi, M., Madani, M. (2018). The Biological Synthesis of Silver Nanoparticles by Mango Plant Extract and Its Anti- Candida Effects. Journal of Applied Biotechnology Reports, 5(4), 147-150. Shadi Salati; Monir Doudi; Mahboobe Madani. "The Biological Synthesis of Silver Nanoparticles by Mango Plant Extract and Its Anti- Candida Effects". 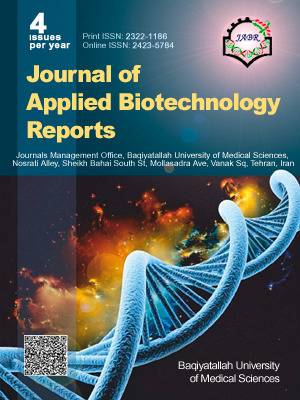 Journal of Applied Biotechnology Reports, 5, 4, 2018, 147-150. Salati, S., Doudi, M., Madani, M. (2018). 'The Biological Synthesis of Silver Nanoparticles by Mango Plant Extract and Its Anti- Candida Effects', Journal of Applied Biotechnology Reports, 5(4), pp. 147-150. Salati, S., Doudi, M., Madani, M. The Biological Synthesis of Silver Nanoparticles by Mango Plant Extract and Its Anti- Candida Effects. Journal of Applied Biotechnology Reports, 2018; 5(4): 147-150. Introduction: In recent years, using the plant products alone and along with metal nanoparticles has been widely considered in preventing or killing pathogens including fungi. Increasing the use of chemical drugs has increased the resistance of pathogenic fungi. The present study aimed at investigating the Biological synthesis of silver nanoparticles by mango plant extract and its anti- Candida effects. Materials and Methods: First, the Indian mangoes were bought from the Isfahan fruit and vegetable market and the kernel were extracted. Then, the nanoparticles synthesis was conducted on mango cores and the synthesized nanoparticles were evaluated using a UV-VIS, XRD machine and a transient electron microscope. In this study, the anti- Candida effects of mango cores nanoparticles was evaluated on 21 clinical isolates and 3 standard strains of Candida including Candida albicans PPTCC 5027and Candida glabrata PTCC 5297 and Candida krusei PTCC 5295 using a quantitative microdilution method (serial dilution in tubes). For data analysis, ANOVA test and SPSS version 22 software were used at the significance level of P ≤ 0.05. Duncan test was used to analyze the groups. Results: Based on the results, the synthesized nanoparticles were cubic and 65 nm in size. Among the clinical isolates, Candida albicans with the frequency of 52.38% and Candida glabrata with the frequency of 4.76% had the highest and lowest frequency among the 21 clinical isolates. Candida glabrata had the most sensitivity with the quantitative serial dilution method (microdilution) with minimum inhibitory concentration of fungal growth (0.016 mg / ml) and the minimum lethal concentration of fungi (0.032 mg / ml) against nanoparticles of mango cores (p≤0.001). Conclusions: The inhibitory effect of the mango cores nanoparticles after fluconazole on the majority of clinical and standard strains of Candida had a direct relationship with increasing concentrations of this substance. However, further studies are required for determining the effect of this bio-nanoparticle on the treatment of candidal infections in humans.